At the recent European Haematology Association (EHA) Annual Congress 2018, Myeloma Patients Europe (MPE) and Video Journal of Hematological Oncology (VJHemOnc), filmed an interview with Dr Michael Hudecek (University of Würzburg, Germany) on the Horizon2020 CARAMBA project. The video was recorded in English and has now been translated into four additional languages: French, German, Spanish and Italian. MPE is collaborating with a consortium of European partners on CARAMBA to study an innovative new treatment for myeloma called chimeric antigen receptor T cell (CAR-T) therapy. 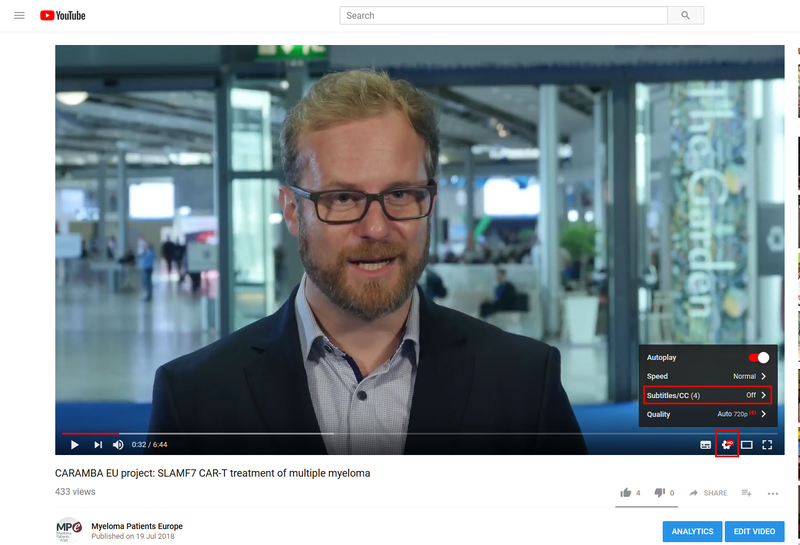 In this video, Michael explains CAR-T cell therapy and the Horizon2020 CARAMBA project in more detail. Alternatively, please email info@mpeurope.org if you have any further questions about the project.